to a monthly newsletter! 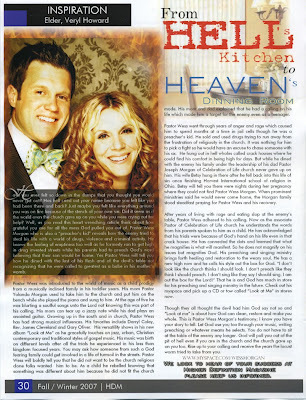 We want to keep you informed about the ministry of Wess Morgan. We will be sending out a monthly newsletter, featuring highlights from Wess' performances, words from Pastor Yolanda Morgan (Wess' Mom) and thoughts from Wess. To sign-up to receive the newsletter, comment below with your e-mail address or send an e-mail to tracieclaiborne@hotmail.com. Please put "Wess Morgan" in the subject line. Thank you for visiting this blog. We hope you will enjoy the newsletter! God bless! Pastor Wess Morgan was featured on The 700 Club today! Click this link to see the video.... click here. "Wow. No wonder that still small voice is so still and small." Sometimes we are not able to detect the still small voice because it has been suppressed by our appetites. It is crucial for us to understand that the sins behind our appetites are progressive - they will only back down to starvation. We have tolerated the demands of our appetites so long that we now can only pacify them. Subtly, our appetites are cultivating our lifestyle. Our habits become part of our subconscious mind and we become acclimated to the lifestyle. Do you consider yourself to be a victim of your lifestyle? Do you find yourself doing things that you would not do in your normal character? If so, know that there is hope. You do not have to be a victim of your subconscious. The reason why I say subconscious is that so many of us have been dictated by our hunger and appetites for so long that our destructive behavior patterns have become second nature. We don’t even give them a second thought. I stated earlier that the sins behind our appetites are progressive and will only relinquish to starvation. In 2 Corinthians 5:7, the apostle Paul stated, "we walk by faith, not by sight." Although Paul was addressing a different scenario, the principle is applicable in this message. Paul said, "not by sight." Sight represents the five senses - the soulful realm. If we’re going to live a victorious life and allow our spirit to dominate our soul, we must starve those appetites that cause us to self-destruct. We must be discerning of what to nurture and what to starve in the emotional realm. I challenge you to take time to evaluate where your present appetites are taking you. Isn’t it amazing that our propensities are to hunger for what’s least best for us? Wow. No wonder that still small voice is so still and small. Some of our appetites are so demanding that many times we are willing to face extreme consequences to appease them. This has been diagnosed in many cases as a form of schizophrenia with medication prescribed. My conviction is that by this, these issues are only pacified. I say it’s disobedience, lack of discipline and sometimes just bad choices. The prescription should be the Word of God and the very Spirit of God. I’ve come to realize that if I’m going to have the abundant life Jesus came to give me (John 10:10), I must continue to evaluate my appetite to ensure I do not take the path of least resistance, only because it’s undemanding. Let’s continue to consider what hunger and desires are growing in us. I will be sharing a thought here each week. I encourage you to purchase a small journal, pray over this word this week and journal as God speaks to you concerning this subject. I am open for questions or comments. Click here to leave a comment or click on "comments" below.